Characterized by its verdant meadows, scenic lakes, and impressive mountain peaks, it’s no wonder the John Muir Wilderness is the second most visited wilderness area in the contiguous United States. The John Muir Wilderness is the second most visited wilderness area in the contiguous United States. Explore the area on more than 590 miles of hiking trails, or spend the day fishing one of the many alpine lakes and streams. If you’re up for a serious challenge, consider hiking Mount Whitney, the highest peak in the contiguous United States. With over 590 miles of hiking trails, popular fishing destinations such as Duck Lake and Lake Virginia, 57 peaks over 13,000 feet, as well as its proximity to the town of Mammoth Lakes, it’s no wonder this is the second most visited wilderness in the United States. The John Muir Wilderness contains 584,000 acres of forest land in both the Sierra and Inyo National Forests. Most enter the park from various locations along US-395. From Mammoth Lakes, proceed just south of town to find access. The wilderness is open year round, but many facilities, campgrounds, and roads close during winter due to heavy snow. 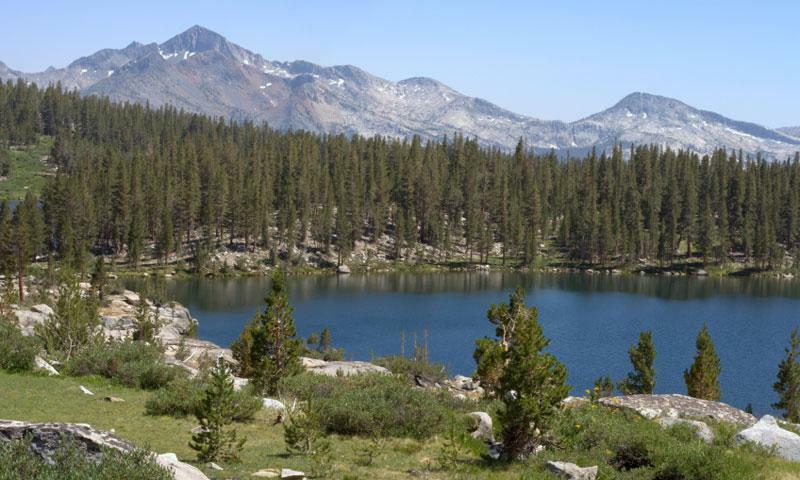 With 590 miles of hiking trails, the John Muir Wilderness is not short on options. To experience all that this wilderness has to offer, consider hiking sections of the John Muir Trail or Pacific Crest Trail. If you’re up for a serious challenge, tackle Mount Whitney, the tallest peak in the contiguous United States. This is trout country – expect brown, cutthroat, rainbow, golden, and brook trout. Popular fishing spots include Duck Lake, where you can find abundant rainbow trout, Dorothy Lakes, and Cotton Wood Lakes. Because of the areas popularity, all overnight trips require permits and are subject to trailhead quotas. Permits can be obtained from the Sierra or Inyo National Forests. For all trails, 60 percent of the quota can be reserved, while the remaining 40 percent is available 24 hours in advance on a first-come first-served basis. There is a $5 charge for reservations. Some of the favorite trailheads include Margaret Lakes, and Mono Creek. Hire a guide for the best backcountry experience. The John Muir Wilderness is home to a variety of unique wildlife including yellow-bellied marmots, black bears and California Bighorn Sheep.